Prince Charles, the Prince of Wales, visited Christiansborg Castle as part of his three country African tour. The castle is a UNESCO World Heritage Site, former seventeenth century European trading post, Danish and British colonial seat of government administration, and Office of the President of the Republic of Ghana. 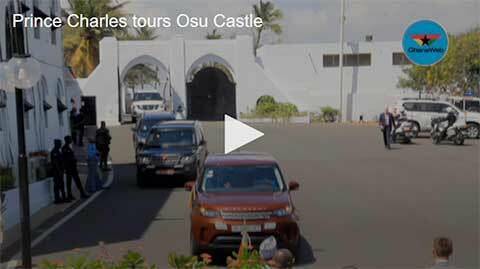 Today, it is locally known as ‘The Castle’ or ‘Osu Castle’. Prince Charles was escorted by Dr. Hon. Zanetor Agyeman-Rawlings, the Member of Parliament for the Klottey Korle constituency, who is also the patron of the Christiansborg Archaeological Heritage Project (CAHP) which began in 2014. Prince Charles met with the Project Director and Principal Investigator, Professor Rachel Ama Asaa Engmann, as well as Benjamin Richter and Ludvig Lutterodt of the Christiansborg Archaeological Heritage Project. Professor Engmann is the great, great, great, great, great granddaughter of Carl Gustav Engmann (1752-7), a Danish Governor at Christiansborg Castle and Board Director of the Danish Slave Trade Organization (1766-1769), and Ashiokai Ahinaekwa, the Osu Chief’s daughter. Other team members include the local community and other Danish-Ga direct descendants who lived in the area surrounding the castle in the C18th and who continue to do so today. Prince Charles examined the cistern and its inscription constructed under Governor Engmann. The Prince also spent time examining some of the artifacts excavated by the team including European and African beads and smoking pipes, European, African and Chinese ceramics, European glassware and other small finds, such as cowrie shells, faunal remains, coins and more. It is intended that the excavated artefact collection will contribute to the government and traditional council’s plans to develop the castle into a museum. A keen archaeology enthusiast, Prince Charles engaged with the team in a discussion over archaeology and his experiences as an archaeologist in his younger days. Prince Charles demonstrated his interest in the eighteenth century British smoking pipes and the various ceramics on display, including those which would have been used when Ghana was a former British colony, as well as those used in the post-independence period. Prince Charles also expressed his delight in the fact that the local community is playing an active role as researchers in the project. The team presented Prince Charles with a gift of a colonial map and some CAHP mugs. They also presented a collection of Ghanaian children’s story books for his forthcoming grandchild to his son and daughter in law, Prince Harry and Meghan Markle (an African American), so that the baby will be able to learn about his or her African heritage. The team would like to express our deepest gratitude to Prince Charles for spending time with us during his very busy schedule to Ghana. We are most grateful. *Note: The team also wishes to express our thanks to Her Royal Highness Camilla, the Duchess of Cornwall for her interest in the archaeological project, when she met with Professor Rachel Ama Asaa Engmann at another earlier event on their tour. 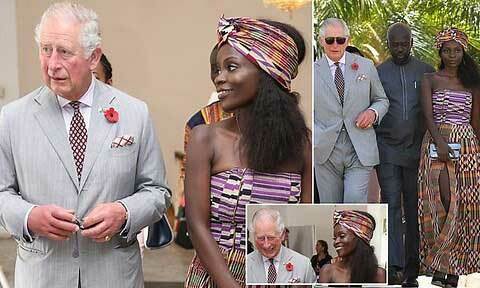 A beaming Charles has been pictured in fits of laughter with a Ghanaian museum board member and getting stuck into cultural displays in The Gambia. 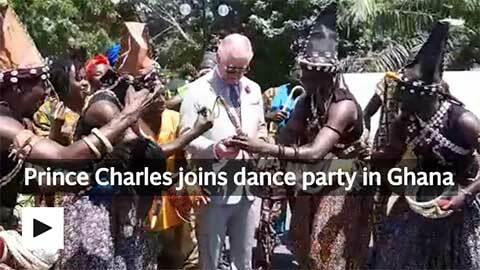 The Prince of Wales joined in an impromptu dance party today, as he was handed a small Ghanaian percussion instrument to take a starring role in a local band. The Prince, who was visiting Christiansborg Castle in Osu, Ghana, was invited into the centre of a small local band as they played for his entertainment. Presented with a calabash, a small instrument not unlike the maracas, he gamely shook it in time with the music as he danced along. Visiting Prince of Wales, Prince Charles today took a tour around the Christiansburg Castle in Osu and Jamestown a suburb of Accra as part of his five day visit to Ghana. 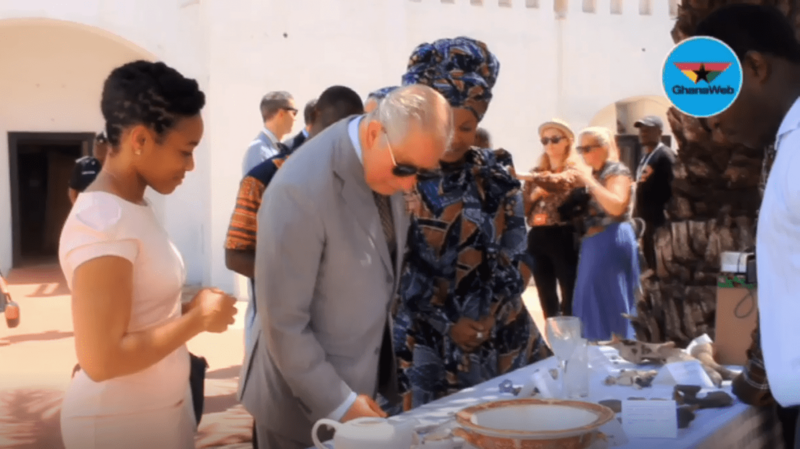 Accompanied by some government officials and dignitaries, Prince Charles was taken round the once British-owned slave fort, which served as the seat of Ghana’s government for decades. He is expected to meet with local policymakers to discuss possible renovation and reuse of the historic landmark.